One of the great character actors, with an enormously productive stage, TV and screen career, Denholm Elliott trained at RADA and served with the RAF (1940-45), including three years as POW; postwar, on stage from 1945, usually in notable new plays, like T.S. Eliot's The Confidential Clerk (1953) though there was also a Stratford season in 1960. On screen from 1949 ( Dear Mr Prohack , d. Thornton Freeland), he was an only moderately interesting young leading man in the likes of The Sound Barrier (d. David Lean, 1952) and Pacific Destiny (d. Wolf Rilla, 1956). There was perhaps something too shy, too cautious, about him for conventional stardom, and he looked sensitive rather than handsome. His real ascendancy began with Nothing But the Best (d. Clive Donner, 1964) as the seedy, minor-public-school man who is Alan Bates ' social mentor, and almost everything he did after this had a touch of this persona - wry, a bit battered, cynical. Whether the films were dross or gold, he never failed to rivet the attention, whether as the abortionist in Alfie (d. Lewis Gilbert, 1966), a decadently trendy parent in the execrable Here We Go Round the Mulberry Bush (d. Clive Donner, 1967), an embittered Krogstad in A Doll's House (d. Patrick Garland, 1973), snobbish Dr Swaby in A Private Function (d. Malcolm Mowbray, 1984), warm-hearted Mr Emerson in A Room with a View (d. James Ivory, 1985) or the decent drunken journalist in Defence of the Realm (d. David Drury, 1985). There were international films as well, including Raiders of the Lost Ark (US, d. Steven Spielberg, 1981), Trading Places (US, d. John Landis, 1983) and The Razor's Edge (US, d. John Byrum, 1984), in Clifton Webb 's original role, and masses of memorable TV: the seedy butler in Blade on the Feather (d. Richard Loncraine, 1980), cynical Philip in Hotel du Lac (d. Giles Foster, 1986) and George Smiley in A Murder of Quality (d. Gavin Millar, 1991). There are over 120 major film and TV credits, and it is hard to encapsulate their versatile understanding and immaculate technique briefly. 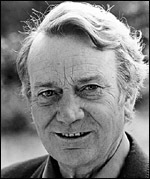 He was married to Virginia McKenna , and his second wife, Susan Elliott, collaborated on a biography, Denholm Elliott - Quest for Love (1994). He died of AIDS complications.